This site has been created with the permission of Oliver Postgate and Peter Firmin, and all images, names and stories of Noggin the Nog remain the copyright of Smallfilms. 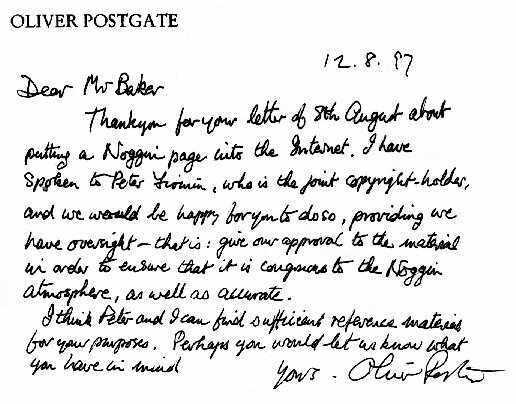 In fact I got a letter from Oliver Postgate, who gave me the go-ahead, and wanted to make sure that it was done in the right spirit. I'd like to take this opportunity to thank Oliver Postgate and Peter Firmin for allowing me to create this site, and their help obtaining the material. Mail me on noggin@smallfilms.co.uk, if you're interested.